Lapis lazuli is known for it's deep blue color. 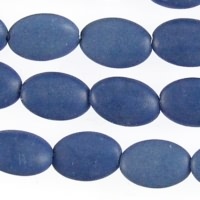 The blue color of these beads have been enhanced. Dyed. Average size: 8mm x 12mm, 4.4mm thick. Strand length approximately 15-16 inches.